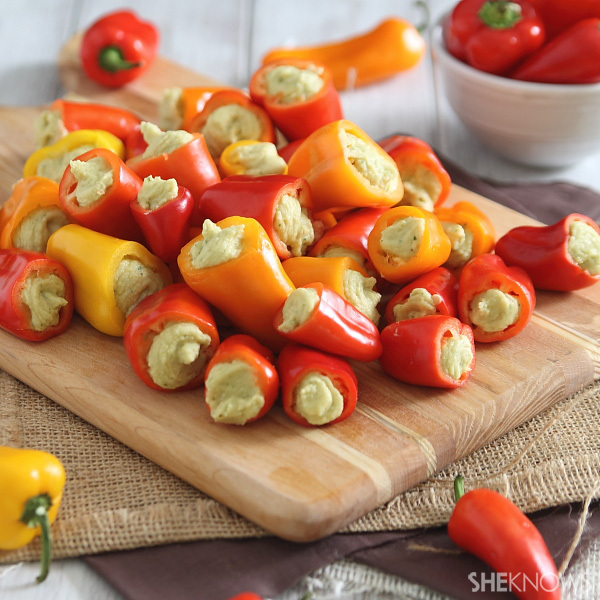 Mini peppers are perfect for stuffing with homemade basil hummus. Every party or get-together always has the designated veggie platter and hummus platter, right? How about combining the two? Mini peppers make the cutest little stuffing vessels (and we all know cute food tastes better) and whipping up some homemade hummus couldn’t be easier. Slice off the tops of the peppers and remove the seeds inside with either a knife or your finger. Place chickpeas, garlic, lemon juice, basil and salt and pepper in a food processor. With the processor running, drizzle in the olive oil. Scrape down the sides and process again, this time adding the water until the hummus is nice and smooth. Spoon the hummus into a plastic bag. Squeeze the hummus down into one of the corners of the bag, snip off the tip and use it like a pastry bag to fill the hollowed out peppers.